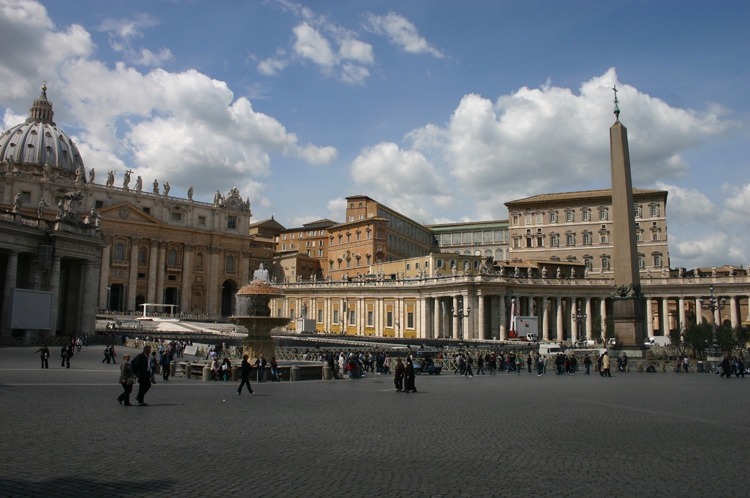 Walk through the Roman, Mediaeval, Renaissance and Baroque heart of the Eternal City. A real risk of being made to think. 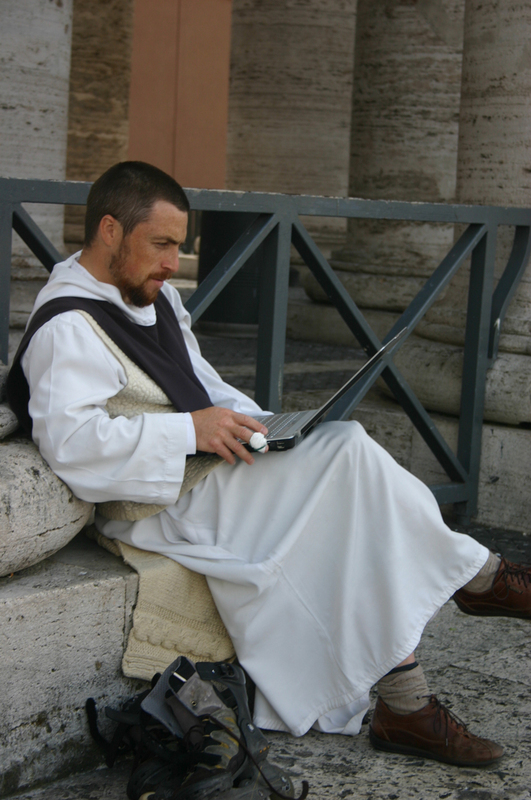 We are not going to write an essay on Rome that great echoing chamber of history, the Eternal Cliché. It has been done before, better than we could, by people who really know. Sufficient to say that no city in the world can match it for historical and cultural richness and resonance: its profusion of Roman relics, if that term is right for things as monumental as the Colosseum; its basilicas and churches from the gloriously monumental to the glisteningly delicate; its masterpieces of painting, sculpture and architecture; its delightful piazzas, meandering, ancient streets and alleyways. It is a walker's delight: wander from monument to church to square to bridge, stopping at cafes in quiet corners for that third cappuccino or second ice cream. Or both. There is so much to see and do, here, that the problem is how to fit it all in. Here are some ideas to help you. 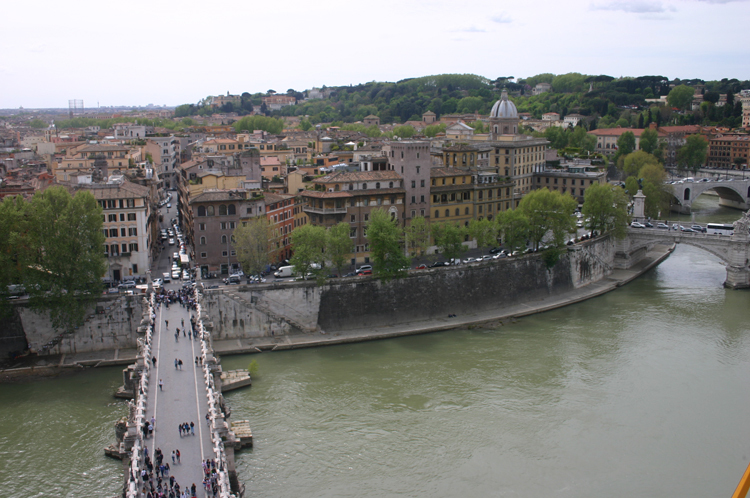 Our Ultimate Rome walk, described below. A very long day, and it of course misses a lot of the unmissable, but it is our best idea at fitting as much of the best into one day as is practicable. Much better, of course, is (if you have time) to wander much more slowly around Romes many fascinating areas. 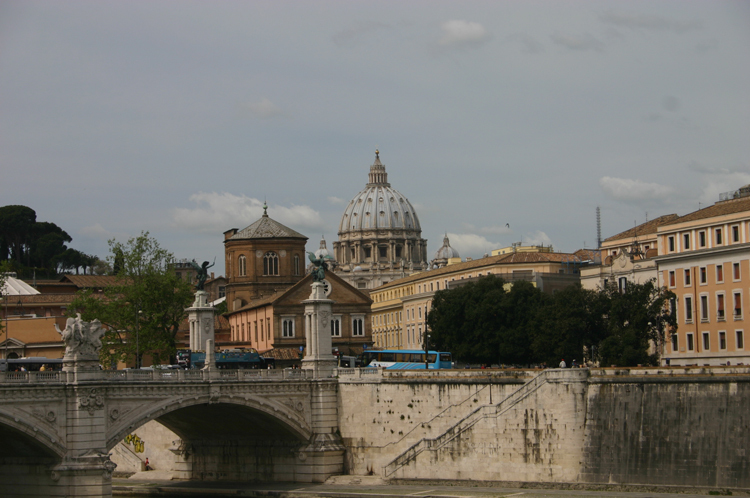 Matthew Kneale's Rome Walks: the famous novelist has lived here for years; see his selection of wonderful walks. Janiculum: this western hill has palaces and villas, sporting Raphaels and Fra Angelicos, botanical gardens, a park on the heights, and possibly the best view of Rome. Via Appia Antica: stroll along the ancient Via Appia, taking in tombs, extraordinary catacombs and the stubs of aqueducts. You can get there by green open-topped buses, themselves a great journey through history. Tivoli: wander through Hadrian's huge (and still elegant) villa and the lovely gardens of the Villa d'Este. The full walk should take nine hours at a leisurely stroll, with time to ponder views and objects, including drink and food breaks. 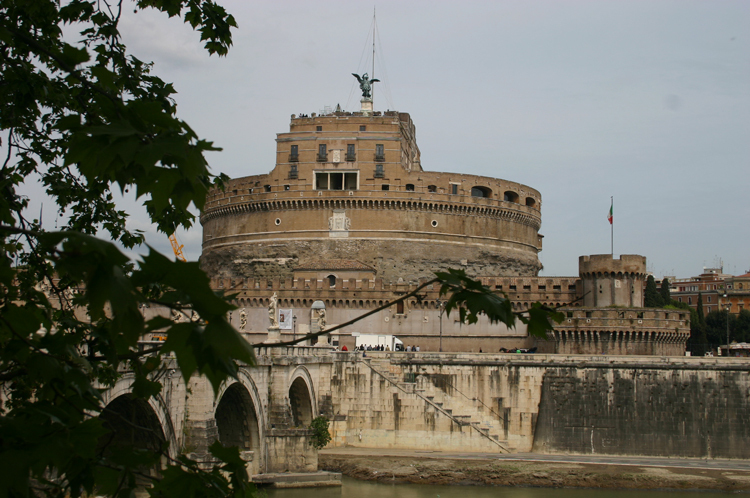 Add 40 minutes each to go into the Colosseum and Castel St. Angelo, and an hour for St. Peters. Whether you feel like tackling the full route depends on your physical and cultural stamina, and how long you spend at the sites. 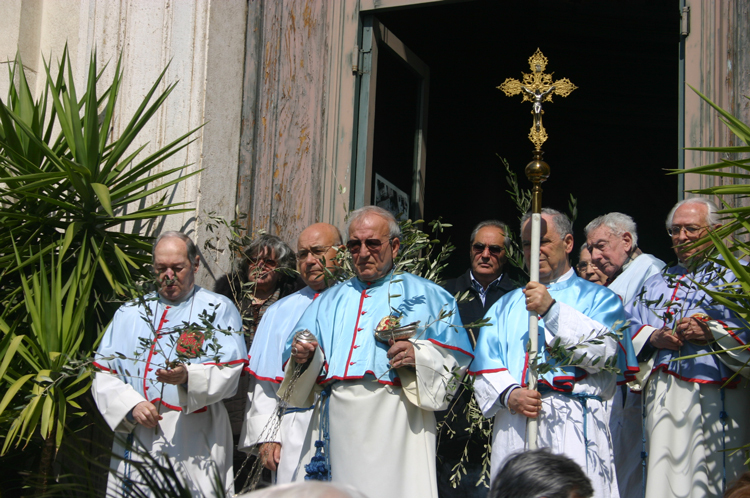 Start at the great basilica of the east, St. John Lateran, the Popes seat in his capacity as Bishop of Rome. 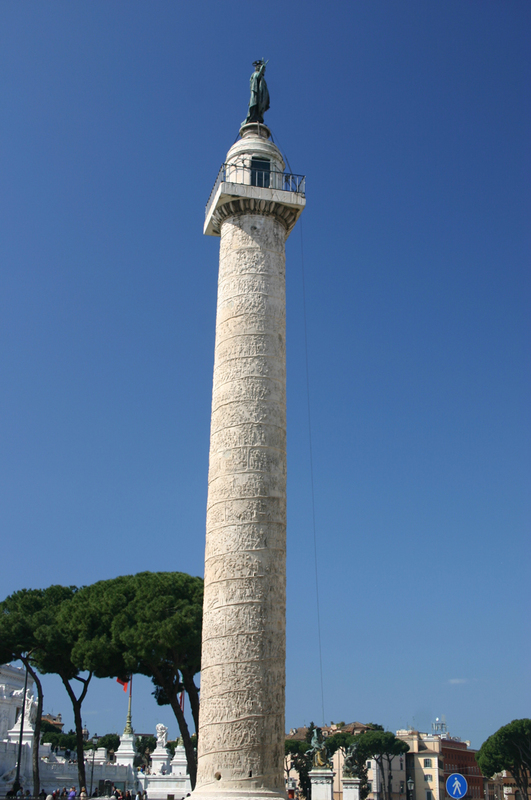 Founded in the 4th Century by Constantine, it has been destroyed by fire twice. The present building is huge and magnificent but teeters on the edge of pomposity. Walk west for 10 minutes or so to one of Walkopedias favourite Roman Churches, S. Clemente (superb Cosmati mosaic floors, C12th mosaics on its walls, delightful courtyard with fountain), fourth century church beneath that, and Mithras temple and underground stream (great for luring church-sick children) below all else. You can cut out St John Lateran, and start at St Clemente to clip an hour from this walk, if you wont have time for the complete route. 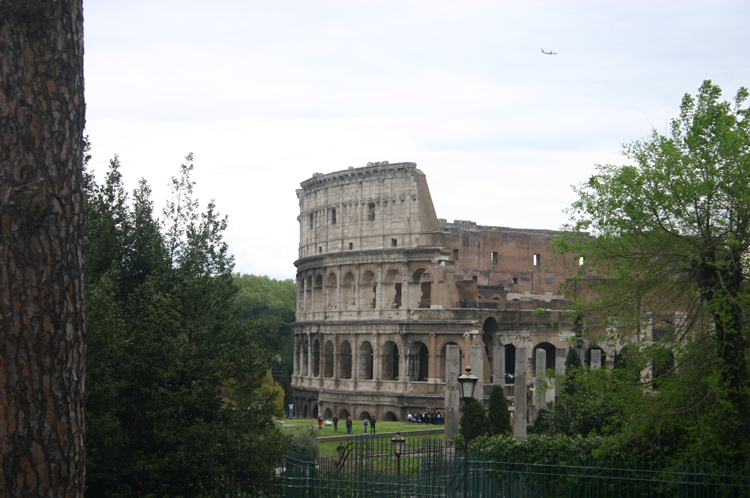 Another five minutes on, and you emerge, suddenly, before the Colosseum in its full glory. 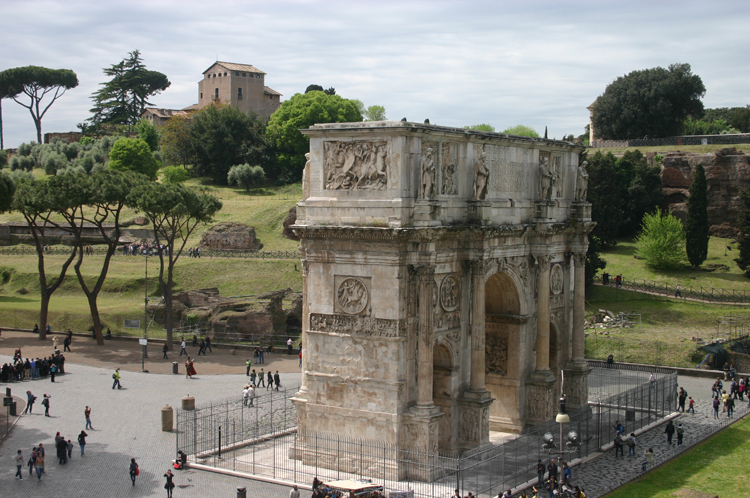 Walk around the left flank, but then walk on, past the magnificent Arch of Constantine, to the entrance to the Palatine in the Via S. Gregorio. 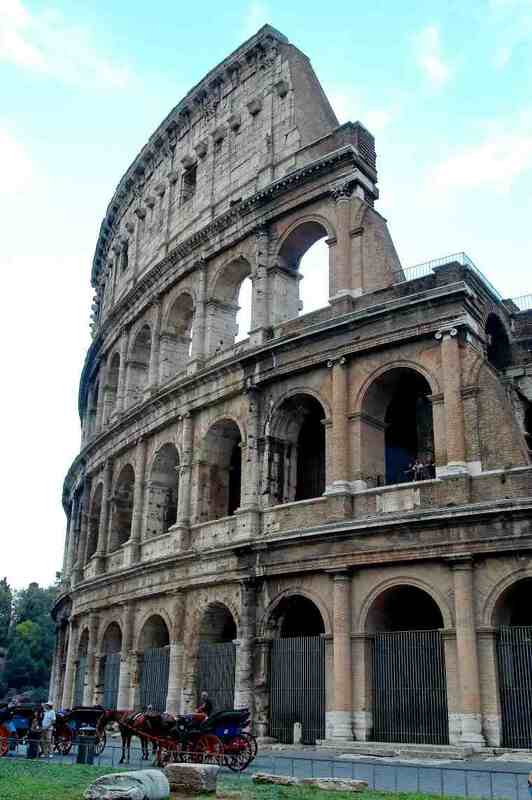 The ticket queues for the Palatine / Forum / Colosseum complex are usually shorter here (thank you Matthew Kneale). 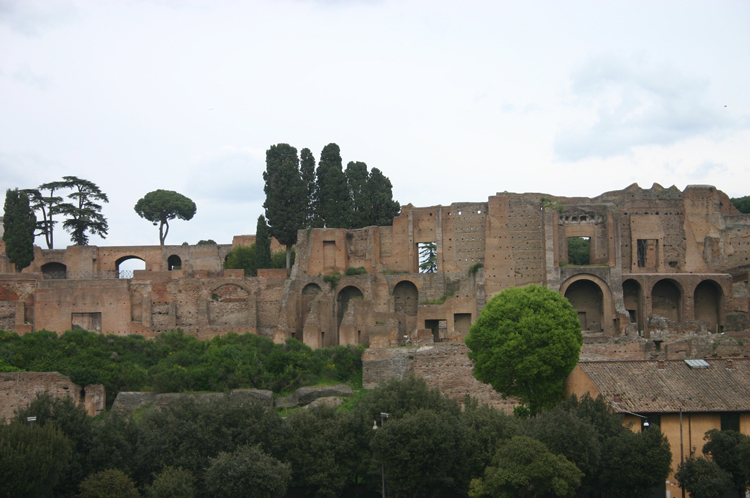 The public Palatine has been greatly expanded in recent decades, and is a delightful mixture of fine Roman pines and other greenery, and the massive remains of the imperial palaces on their vast vaulted platforms. Dont miss the stadium, a good gawp south over the Circus Maximus, the Domus Livia (if open), the Cryptoporticus and the Farnese Gardens with their panoramic views across the Forum. Dropping down to the Forum, you have two choices: if you want to go inside the Colosseum, head west into the Forum first, then arc back to the Colosseum to immerse yourself in the grandeur, horror and pathos of its interior. Then stroll down Mussolinis overwheening Via dei Fori Imperiali; taking a good look at the huge and impressive Trajans Market with its remarkably intact streets of shops (and dont miss his superb Column). The market has been recently restored and is hugely evocative of the wealth and energy of the Roman economy. 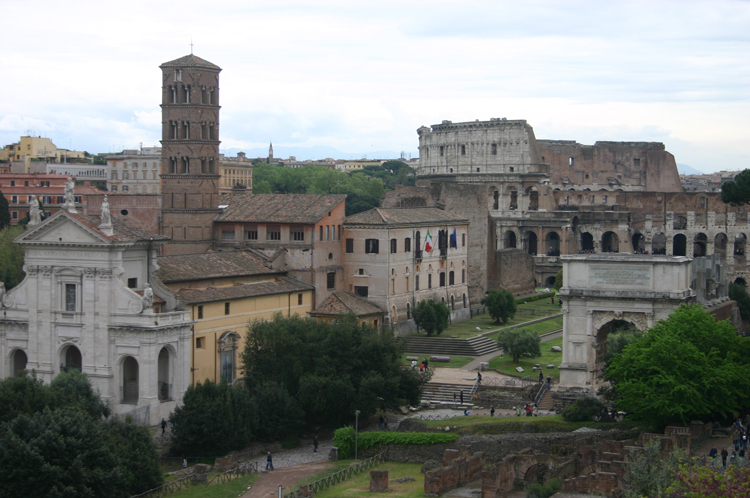 If you are happy to miss the inside of the Colosseum this time, take in the Forum east to west, then leave by the Via dei Fori Imperiali exit and cross over to gawp at Trajans Market and Column. 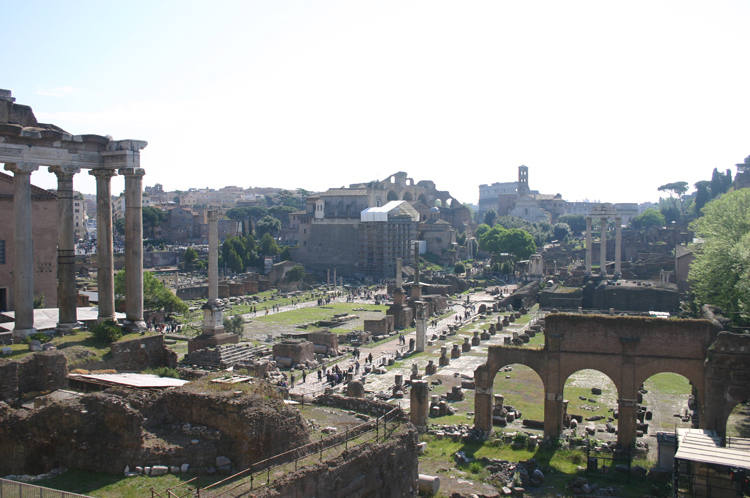 The Forum, ceremonial and commercial heart of the Empire, is usually hideously crowded, and is such a jumble of stumps, porticoes and walls that it can be hard to visualize how it would have looked or indeed what it was all for. 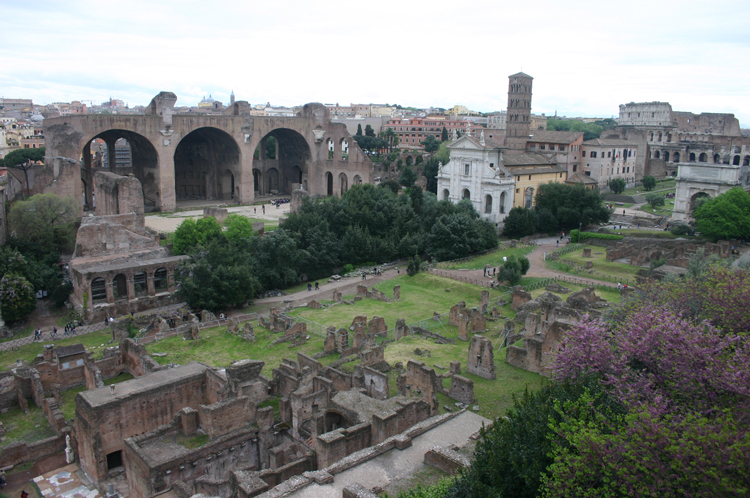 But it is not to be missed make sure you contemplate the delicate, refined remains of the Temple of Vesta and the vast arches of the Basilica of Constantine and Maxentius. Allow at least an hour. 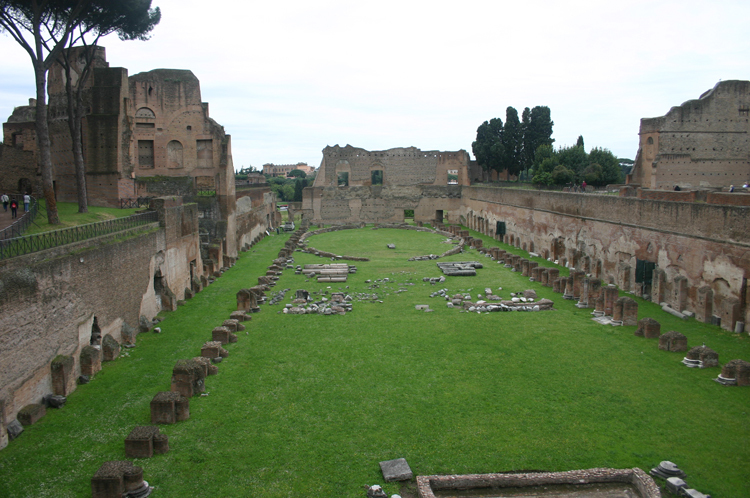 Eat a picnic in some quiet corner of the Palatine or the Forum. 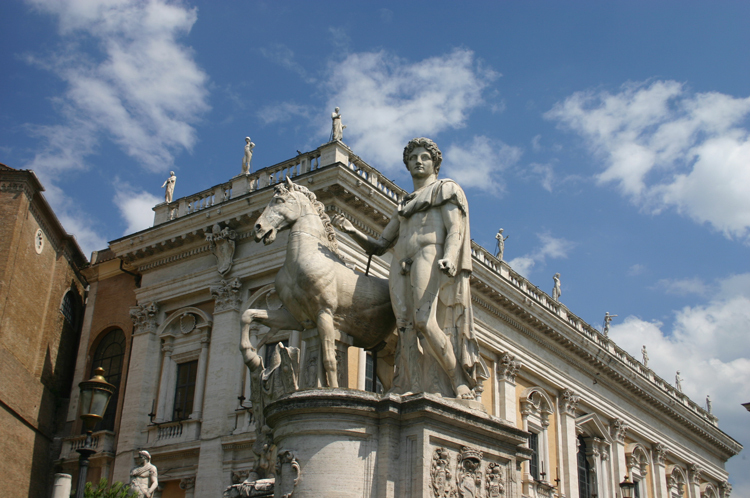 Pass between huge classical statues of Castor and Pollux, then descend Michaelangelos grand Cordonata staircase to Piazza Venezia, a traffic-compromised and disappointing square dominated by Romes most pompous monument, but Romes centre nonetheless. Being Rome, it is lined with fascinating things (the stump of a Roman insula or apartment block just below the VE Monument) and magnificent ones (the grand harmony of the Renaissance Palazzio Venezia). Give the gloomy, trafficky Corso a miss, and head through the backstreets (taking in the Jesuits first church at Ges and other delights along the way divert northeast to the Trevi fountain and Spanish Steps if you are a desperate glutton for punishment; or to the Temple of Hadrian, Marcus Aurelius Column and St. Ignatius if only a mild one) to the Pantheon and its delicious square, along with Piazza Navona Walkopedias favourite Roman square (we are nothing if not predictable); both excessively touristy, but marvelously atmospheric nonetheless. Have a well-deserved drink and ignore the cost. 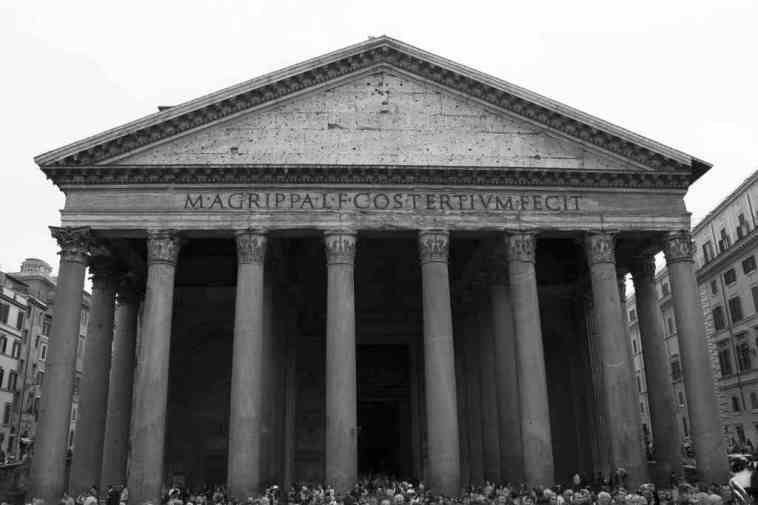 The Pantheon is a truly extraordinary building and you will remember it as such despite todays hot competition. Its vast dome has stood for nigh on 2,000 years, its interior a vibrant intimation of how a grand Roman interior would have looked despite having been a church for several hundred years. 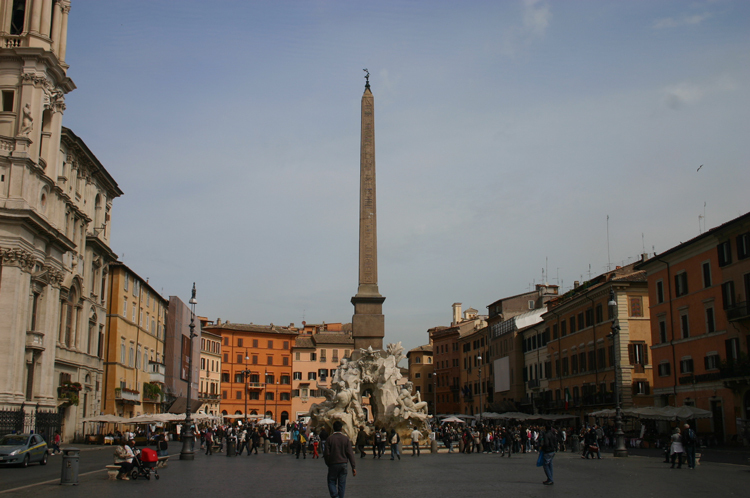 Then it is delightful, quirky Piazza Navona, its long, round-ended shape giving away its origins as Domitians vast horse racing stadium its houses built on the remains of the stadiums terracing. Take time out for another thoroughly deserved (if pricey) drink (both liquid and atmospheric). The Obelisk-supporting Fontana dei Quattro Fiumi is a gem. Delightful ancient, narrow winding streets and charming little piazzas (and a stretch of Via dei Coronari, the atmospheric old pilgrim street) take you to Ponte SantAngelo, Romes most beautiful bridge with its Bernini angels and alignment with the maw of Castel SantAngelo, the one-time Papal fort and residence, itself worthy of a detour to delve into its sometimes sinister history and to savour its views back across the Tiber to the roofs and domes of Rome. Then it is the final stretch up the dramatic, theatrical, but unlovely and fascisty-feeling Via della Conciliazione to the pilgrims final destination, St Peters, centre of the Catholic world, masterpiece of Renaissance architecture teetering into pomposity, behind you the grand, harmonious sweep of Berninis Piazza San Pietro. Buy a tipple and nibble, and consume them on the steps of his great arcade, or (if your legs can stand it) as you wait in the queue to get into the great church. 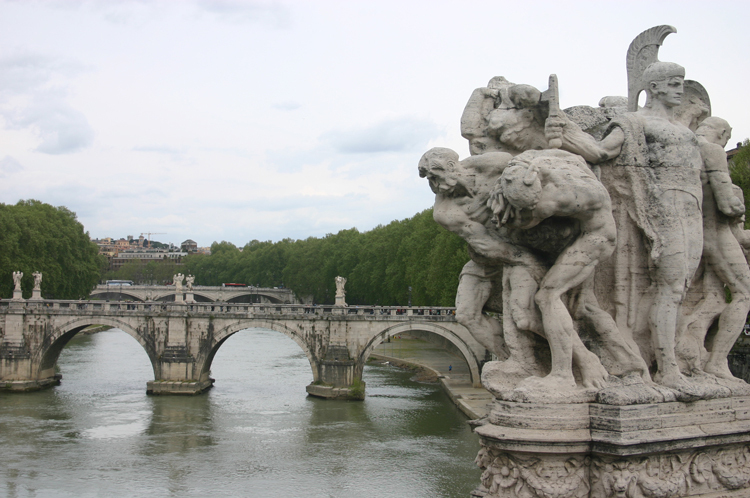 It is better to come back another time, as St Peters requires energy and deserves attention. If you have time another day, you could finish this walk at Piazza Navona, then process, pilgrim-like, to the great building, for a fitting buildup to an inspection of its vast interior.